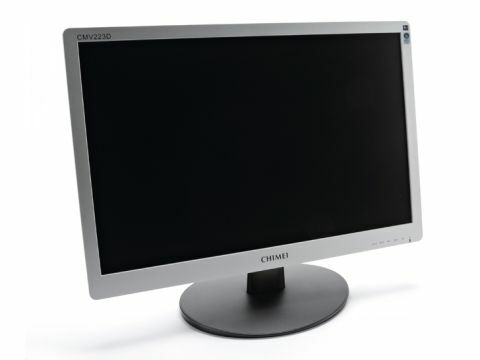 Our spirits dropped a notch or two on our excite-o-meter when we unpacked this 22-inch widescreen monitor. Black-and-silver plastic combos are hardly eye-catching these days, and on more than one occasion it's been an early indication of a cheaply made monitor. But Chimei has a few tricks up its sleeve to ensure that the 223D isn't just another run-of-the-mill widescreen affair. Looking beyond the colour scheme and plastic feel, the 223D has an attractive rounded appearance that keeps things simple. The placement of status LEDs to the bottom-right of the monitor is well concealed and an improvement on the rather garish lights of Chimei's previous models. It's also one of the most genuine flatscreen models we've seen, with only slight protrusion at the back, just above where the stand originates. It's weightier than many models in its class, but that's a positive sign and gives the monitor a sturdy feel. The 223D features a fully native 1,680 x 1,050 resolution, which simply sparkles. Colours appear rich and of good saturation, but as with any monitor we would recommend a tweak with a calibration device to account for your monitor's environment. The viewing angle is also excellent, which is often a problem with cheaper monitors. We liked the simplistic approach to adjustments offered by the various program modes. Alternating between pre-programmed Picture and the dimmer Text and Economy modes is simple, while adjusting brightness and contrast is quickly achieved. Colour temperature (represented in Kelvin, for those familiar with Photoshop) is also adjustable using three presets or via sRGB. A maximum temperature of 9,300K leads to over-saturation, but it helps having that range if you're a photography enthusiast. We found blacks were represented particularly well - something that can be weak on cheaper displays. For just £200 you can't really go wrong with this smooth Chimei display, but if you're bored of black and silver the 223D won't provide any respite.